is a CataNetwork's Reviewers' Choice Award winner! 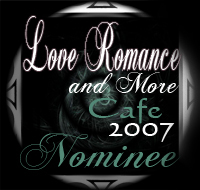 TALES FROM LACHMUIRGHAN is a Love Romance and More Cafe 2007 Award Nominee for Best Anthology! Welcome to Lachmuirghan, where fantasies come true. You may have trouble finding Lachmuirghan on a map. That’s because it exists only in our imaginations. Hidden in this secret valley, Lachmuirghan can be whatever you want it to be. Imagine a sheltered valley and loch somewhere in the west of Scotland. At the head of the valley is an ancient circle of standing stones; at the lower end stands a ruined castle overlooking the bustling village center. As you explore, suddenly you notice things are not quite as they should be. The village is the same, yet somehow changed. You notice that you have also changed—your senses are more alive than you’ve ever known. You stand at a strange yet familiar crossroad. Out of the mist, a voice calls your name. Where will you go? And to whom? In this fantasy world, the choice is completely yours.